Make a great living as a pro musician. Most people want to know the answers to these questions and you probably do too. Everybody knows that you need to actually do things to build your career. The problem is that few people ask the next logical question, which is: what should you NOT do if you want to build a successful music career? What beliefs, attitudes or actions could hold yourself back from making it in the music industry? When you know what to do and what not to do to become a pro musician, you can reach your goals a lot faster and build the music career you’ve always wanted for yourself. Without this knowledge, making it as a professional musician becomes very difficult and incredibly frustrating. People who are not experienced in starting and growing a successful music career usually lack the big picture understanding of what it takes to make it in music. These musicians will usually give you incomplete, misleading or wrong music career advice. What this means for you is: you make a lot of mistakes in your music career that hold you back from achieving real success. What to do instead: Seek out people who really understand what it takes to become successful in the music industry who can tell you exactly what works and what doesn't work. Follow their guidance to build your music career. Studying the music business is no different than going to medical school to become a doctor, going to flight school to become a pilot or becoming an expert in any other profession. The most important thing to learn first is what the music industry is looking for in you. This tells you how close you are to making it in your music career. Take this quick music career quiz to learn how prepared you are for big success as a pro musician. Learn how to quit your day job and pursue a successful music career. 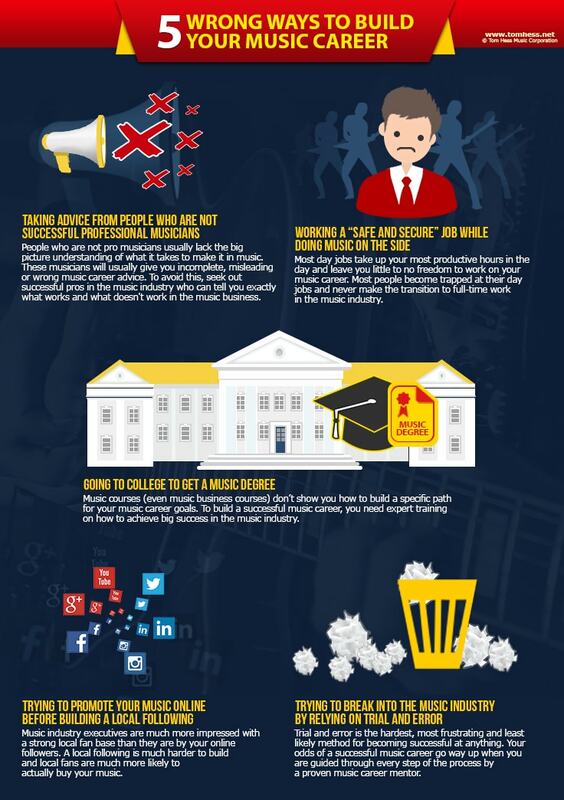 Learn the first steps to take when starting a successful music career. You’ve probably heard that you should have a back up plan in case your music career doesn't work out. This back up plan usually consists of getting a job in something totally unrelated to music (or the music business). Most musicians who get such a job try to build their music career on nights and weekends. Most day jobs take up your most productive hours in the day (the time when you have the most energy to get things done). This means you only have a little bit of time & energy left to work on your music career each week. If you start a family, this leaves you even less time to work on your music career. It’s scary for most people to give up their day job’s income and begin working full time in the music industry. Most musicians have no experience being an entrepreneur and don't know how to replace their job’s income with music career income. This means you can become trapped at your day job until retirement and never pursue your dreams fully. Very frustrating! Learn how to make money in music as soon as your musical skills reach an intermediate level. Build multiple streams of income for yourself to make your career secure and stable. Start teaching your instrument. This is the easiest (and fastest) way to earn money from music while having a lot of control over your schedule. You also earn a lot more money per hour of teaching than you do from most day jobs. This means you can work fewer hours to earn money and have more time to invest into your music career. Read this page to learn how to easily attract a lot music students even if you have never taught music lessons before. How to get a record deal. How to build multiple streams of income, so your music career becomes very safe, secure and lucrative. How to get gigs (that pay well). How to phase out your day job (without going broke) and become a pro musician. How to go on tour (and make money in the process). What to do instead: Seek out a proven music career mentor how has helped other musicians achieve significant success in the music industry. Your mentor must have a vested interest in helping you succeed and build your career. When you study with such a mentor, you save a lot of money & time and become successful much faster. It’s much harder to build a local following in a smaller area than it is to obtain followers spread out all over the world. Local followers from your area are a lot more likely to actually be fans of your music (who come to your shows and buy your records & merchandise). These are the people record companies care about the most. The larger your local fan base is, the more value you present to record companies. 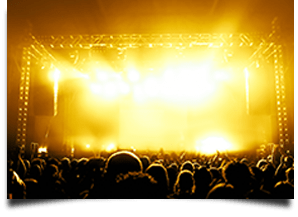 Action step for you: The easiest way to build a local following is by playing gigs regularly. When you have a steady gigging schedule, it becomes easier to grow your fan base and strengthen your relationships with your current fans. This grows your reputation in the music industry and helps you get noticed by record companies. Trial and error is the hardest, most frustrating and least likely method for becoming successful at anything. Sadly, this is how most musicians try to make it in the music business. Record companies, music promoters, publishers, booking agents and other entities in the music business want to work with musicians who understand the business side of music. They have little time or patience to teach you things you can and should learn on your own about how the music industry works. What to do instead: Educate yourself on how the music business works and stop relying on guesswork to navigate the music industry. This dramatically increases your chances of making it in music and helps you create the life you’ve always wanted for yourself. You now know what mistakes can hold you back from a successful music career. Your next step is to learn what the music industry looks for in you and discover how close you are to making it. Take this music career quiz to learn how prepared you are for big success as a pro musician.